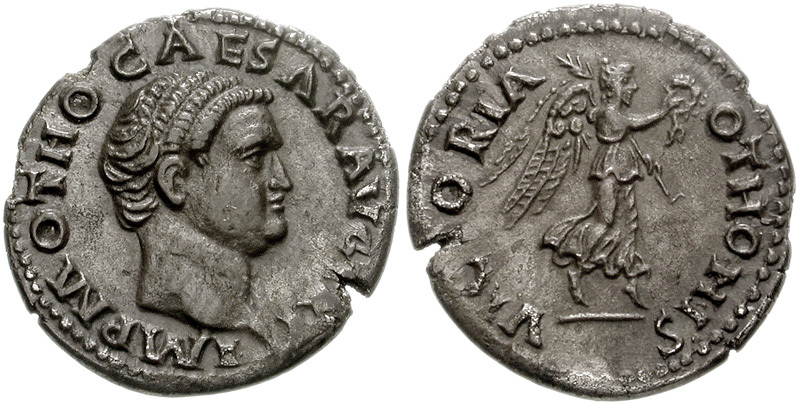 Roman Imperial Coinage - Otho (15 January - mid-April 69 AD). 1 X AR Denarius . Rome mint. Struck 69 AD. IMP M OTHO CAESAR AVG TR P, Bare head of Otho to right. Rev. CERES AVG, Ceres, draped, standing to left, holding two corn-ears in right hand and cornucopia in left. 2 X AR Denarius . Rome mint. Struck 69 AD. IMP OTHO CAESAR AVG TR P, Bare head of Otho to right. Rev. CERES AVG, Ceres, draped, standing to left, holding two corn-ears in right hand and cornucopia in left. RIC I 2. C 1. 3 AV Aureus (7.31 g). Rome mint. Struck 69 AD. IMP M OTHO CAESAR AVG TR P, Bare head of Otho to right. Rev. PAX ORBIS TERRARVM, Pax, dressed, standing l., holding olive branch in r. hand and caduceus in l.
BMC2; BN 2; Calicó 524; C 2; RIC 3. 4 AR Denarius (3.56 g). Rome mint. Struck 69 AD. IMP M OTHO CAESAR AVG TR P, Bare head of Otho to right. Rev. PAX ORB - IS TERRARVM, Pax, dressed, standing l., holding olive branch in r. hand and caduceus in l.
BN 3. RIC 4. BMC 3. C. 3. 5 X AV Aureus, 15th January - March 8th 69. IMP OTHO CAESAR AVG TR P Bare head l. Rev. PAX ORBIS TERRARVM Pax standing l., holding branch and caduceus. 6 AR Denarius, 15th January - March 8th 69, 3.54 g.
IMP OTHO CAESAR AVG TR P Bare head r. Rev. PAX ORBIS TERRARVM Pax standing l., holding branch and caduceus. C 5. BMC 4. RIC 6. CBN –. 6 var AR Denarius, 15th January - March 8th 69. RIC 6 var (head right). 7 Aureus (Gold, 7.40 g, 5h), mid January-mid April 69. IMP M OTHO CAESAR AVG TR P Bare head of Otho to right. Rev. SECVRITAS P R Securitas standing left, holding wreath and scepter. Biaggi 271. BMC 13. BN 7. Calicó 531b (this coin). C. 16. RIC 7. Vagi 834. A magnificent coin, lightly toned and lustrous with a splendid portrait, one of the finest aurei of Otho in existence. Virtually as struck. 8 Denarius January - April 69, AR 3.37 g.
IMP M OTHO CAESAR AVG TR P Bare head r. Rev. SECV – RI – TAS P R Securitas standing l., holding wreath and sceptre. RIC 8. BMC 18. C 17. CBN 10. 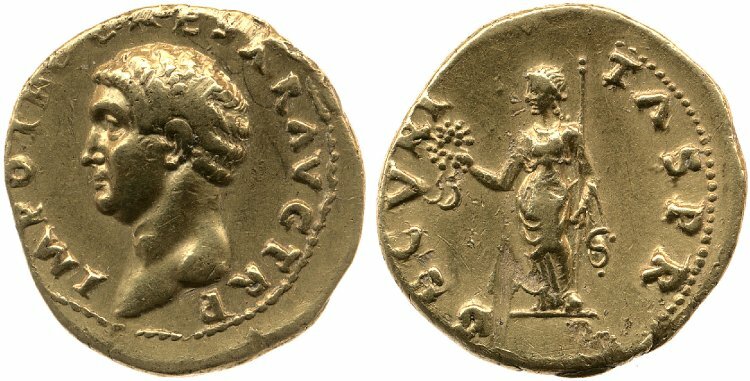 9 Aureus 15 January – mid April 69, AV 7.34 g.
IMP OTHO CAESAR AVG TR P Bare head r. Rev. SECVRI – TAS P R Securitas standing l., holding wreath and sceptre. Kent-Hirmer pl. 62, 216. Calicò 529. C 14. BMC p. 366, note †. CBN 9. RIC 9. 10 AR Denarius (3.42 gm). Rome mint. IMP OTHO CAESAR AVG TR P, bare head right. Rev. SECVRITAS P R, Securitas standing left, holding wreath and sceptre. RIC I 10; BMCRE 19; BN 7; RSC 15. 11 AV Aureus (7.13 g, 6h). Rome mint. IMP OTHO CAESAR AVG TR P, Bare head left. Rev. SECVRITAS P R, Securitas standing left, holding wreath and scepter. RIC I 11; BMC 16. 12 AR Denarius (3.39 g, 6h). Rome mint. RIC I 12; RSC 19. Good VF, scratch on obverse, minor porosity, hairline flan crack. Very rare with bare head left. 13 AV Aureus (7.33 g). Rome mint. IMP M OTHO CAESAR AVG TR P, Bare head right. Rev. VICTORIA OTHONIS, Victory, draped, flying right holding wreath in right hand and palm in left. RIC I 13; BMC 21. 14 AR Denarius (3.44 g, 12h). Rome mint. IMP M OTHO CAESAR AVG TR P, Bare head right. Rev. VICTORIA OTHONIS, Victory flying right, holding wreath and palm-branch. RIC I 14; RSC 27. 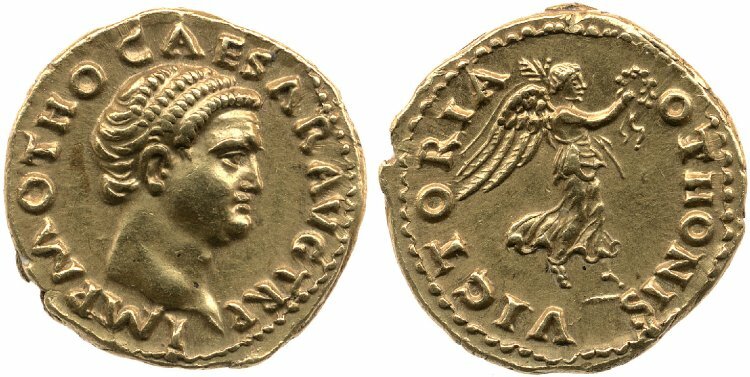 15 Aureus January 15th-March 8th 69, AV 7.35 g.
IMP M OTHO CAESAR AVG TR P Bare head r. Rev. VICTORIA OTHONIS Victory, draped, alighting l., holding wreath and palm branch over l. shoulder. RIC 15. BMC 23. C 23. CBN 20 (these dies). Calicó 535. 16 AR Denarius 15 January to mid-April 69, Rome. 3,50 g.
IMP M OTHO CAESAR AVG TR P Bare head to r. Rev. VICTORIA – OTHONIS Victoria alighting to l., holding wreath in r. hand and palm branch in l. hand. RIC 16. BMC 24. C. 24. Very rare. Well centred on broad planchet with fine portrait. Extremely fine. 17 AR Denarius, 69. 3,45g. IMP M OTHO CAESAR AVG TR P. Bare head to r. Rev. VICTORIA - OTHONIS. Victoria standing to l. on globe, holding wreath in r. hand and palm branch in l. hand. RIC 17. C. - . BMC 25. 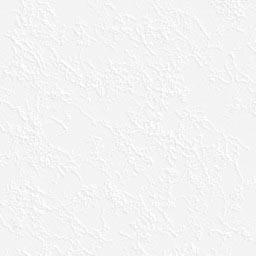 CBN - . 18 AV Aureus (7.15 g, 6h). 15 January to mid-April 69, Rome. IMP OTHO CAESAR AVG TR P Bare head to r. Rev. PONT MAX Aequitas, draped, standing left, holding scales in right hand and rod in left. 19 AR Denarius. 3.53 g.
IMP OTHO CAESAR AVG TR P Bare head r. Rev. PONT - MAX Aequitas, wearing long robe and mantle, standing l., holding scepter with her l. hand, scale with her r. hand. RIC 261, 19. C. 9. BN III, 69, 22. 20 X AV Aureus. March-April 69. IMP OTHO CAESAR AVG TR P Bare head r. Rev. PONT – MAX Ceres standing l., holding two corn-ears and cornucopia. 20 note AR Denarius. March-April 69, 3.39 g.
C 11. BMC 9. CBN 24. RIC 20 note. 21 AR Denarius. March-April 69, 3.49 g.
IMP OTHO CAESAR AVG TR P Bare head r. Rev. PONT – MAX Jupiter, naked to waist, seated r. on throne holding scepter and thunderbolt. BM-10 pl. 60.6 (same rev. die), Paris-26, C-8 (30 Fr. ), RIC-21 (R3). 22 AR Denarius, 69. 3,29g. IMP OTHO CAESAR AVG TR P. Bare head r. Rev. P - ONT - MA - X. Otho, in military dress and with cloak flying, on horseback r., r. brandishing spear. RIC 22. C. 12. BMC 12. CBN 27. 23 AV Aureus (7.62 g, 6h). 15 January to mid-April 69, Rome. IMP OTHO CAESAR AVG TR P Bare head to r. Rev. PONT MAX Vesta, draped, seated left, holding wreath in right hand, sceptre in left. 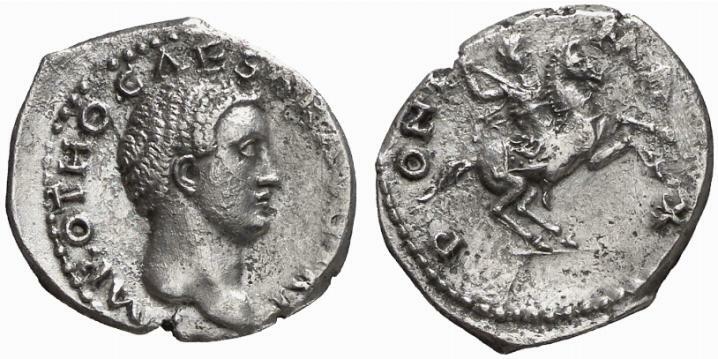 24 AR Denarius 9th March – mid-April 69, 3.52 g.
IMP OTHO CAESAR AVG TR P Bare head r. Rev. 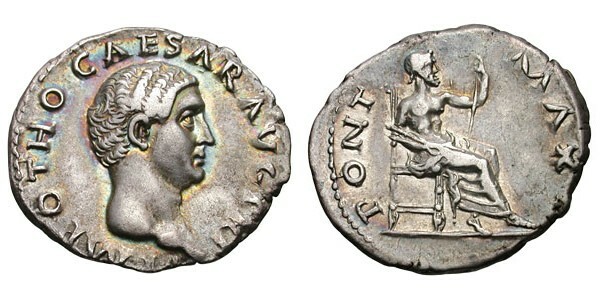 PONT – MAX Vesta, draped, seated l., holding patera and transverse sceptre. RIC 24. BMC 11. C 7. CBN 29. Very rare. A fabulous portrait perfectly struck in high relief.